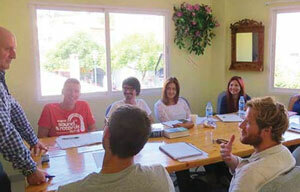 Why Study Spanish in Spain at Alhambra Instituto? Learn Spanish in Spain much faster than with traditional learning methods, with knowledge of Spanish you create infinite possibilities. Learn Spanish means to acquire skills which you can improve your professional and personal quality of life. We are a traditional Spanish school for foreigners with a family-friendly atmosphere, but also with the latest advances in technology for teaching foreign languages and of course the Spanish language. With interactive whiteboard in the classroom, you will learn 40% more than with the conventional system. Multimedia technology combined with appropriate instructional design can create a good learning environment that not only leads to effective language learning but also is highly motivational. Alhambra Instituto has an interactive whiteboard in each classroom.